Provide comfort for the family of Viola Moss with a meaningful gesture of sympathy. 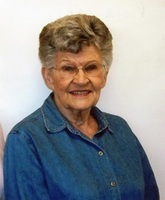 Viola P. Moss, age 96, of Wooster, died Friday, March 29, 2019 at her residence. She was born on February 2, 1923 in Wooster, to Fred and Mable (Miller) Ramseyer. Viola Grew up on a farm in the Smithville area. On April 19, 1943, she married Argyle "Al" Moss in Jacksonville, FL. where he was serving in the US Navy. He died in 2013. She retired from Borg Warner (now Rexroth Corporation). Viola enjoyed writing. She composed notebooks for special people in her life that featured her favorite recipes and included inspirational messages. She also enjoyed crocheting, flower gardening, identifying and feeding birds, especially bluebirds, and nurturing Monarch butterflies. She crocheted many afghans for special people in her life. She and Al were Western-Style square dancers for many years. They danced with clubs throughout the country and were associated with Gnat Boxers Square Dance Club, Wooster. She cherished being part of a close and caring neighborhood on Lehr Road, where she had lived since 1948. She had attended Smithville Brethren Church. Surviving are a daughter, Judy (Dwight) Wasson of Wooster; grandchildren, Sara (Brian) Reich and Andrew (Brianna) Wasson all of Wooster; Lauren (Stephen Reichert) McCullough, and Erin McCullough all of Westerville; brothers, Homer Ramseyer, of CA., and Floyd Ramseyer of Orrville; great-granddaughters, Grace and Hanna Wasson; and a son-in-law, Robert McCullough of Westerville. In addition to her parents and husband, she is preceded in death by a daughter , Joyce McCullough who died in 1992; sisters, Esther Moses and Bernetha Beery, and a granddaughter, Meghan McCullough. The family is very grateful for her dedicated caregivers. Services will be held Tuesday, April 2, 2019 at Custer-Glenn Funeral Home, 2284 Benden Dr., Wooster with Pastor Art Carr officiating. Interment will follow at Smithville Cemetery. Visitation will be one hour prior (1:00 - 2:00pm.) to services at the funeral home. Memorial contributions may be made in lieu to flowers to either: LifeCare Hospice, 1900 Akron Rd., Wooster, OH 44691 or The Marfan Foundation, 22 Manhasset Ave., Port Washington, NY., 11050-2023. To send flowers in memory of Viola P. Moss (Ramseyer), please visit our Heartfelt Sympathies Store. We encourage you to share your most beloved memories of Viola here, so that the family and other loved ones can always see it. You can upload cherished photographs, or share your favorite stories, and can even comment on those shared by others. Provide comfort for the family of Viola P. Moss (Ramseyer) by sending flowers. Nanny will always be... Nanny, not Vi to me! I never knew her "real" name was Vi until I was much older. She was a true blessing in my life. Having the memories of growing up at her and Al's house will forever be cherished! She truly was another grandma to us Lyons girls and that is something special she gave to us all! What a remarkable influence Vi was in our lives and what blessings her love and faith were to all who knew and admired her. She was a devoted mother, grandmother, sister, aunt, friend and neighbor. Knowing she has found her eternal reward brings joy and peace to our hearts. God bless her family and all those close to her as we miss her presence on this earth. Let us all rejoice that we can treasure this extraordinary woman in our memories for the rest of our days.